Harbour Light Strategic Marketing of Portsmouth, NH has donated a new logo design to help raise funding for illumination of the Memorial Bridge connecting Portsmouth, NH and Kittery, ME. The design will be used to raise community awareness for the illumination project and brand local businesses who have donated. The new lighting plan will make a local icon even more striking and we're excited to be a part of it. Harbour Light Strategic Marketing has designed a new iconic logo to help fundraising efforts for the illumination of the new Memorial Bridge. The bridge has been an icon on the Seacoast for over 90 years and the new bridge and illumination will build on that tradition. The bridge connects the communities of Portsmouth, NH and Kittery, ME. "When Ben Porter asked us years ago to build a website for Save Our Bridges we jumped right in to help" said Ned Savoie, Creative Director with Harbour Light Strategic Marketing. "The Memorial Bridge is an important link for us, both professionally and personally. 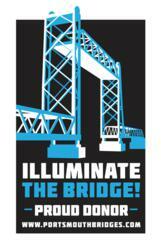 When we were asked to develop a new identity to raise funds for the lighting of the bridge there was never a question. The new lighting plan will make a local icon even more striking and we're excited to be a part of it." The new logo was designed by Robert Squier, Senior Art Director at Harbour Light, and one of the most talented illustrators on the Seacoast. “The logo harkens back to the classic iconography of the Federal Art Project (FAP), a section of the Works Projects Administration (WPA),” stated Savoie. “The WPA helped pull the country out of the Great Depression in the 1930’s, when the bridge was still new. It simplifies the elements and focuses the message to create a classic, memorable icon. Robert did an incredible job creating something timeless.” The logo will be featured on decals to help the public identify businesses who have contributed to the lighting of the new bridge. Harbour Light Strategic Marketing is an award-winning strategic marketing agency located in Portsmouth, NH. Since 1995, we've specialized in creating engaging marketing tools, successful brands, productive websites, unique advertising campaigns and other implements of success for companies around the block and around the country.